It has been a while since we have seen Priyanka Chopra in Indian wear. Well, that was expected considering that the In My City singer is hardly in our cities. And God knows she won’t wear a saree to strut around 5th Avenue in New York on just another regular day. But as much as we miss watching Priyanka in Bollywood films, we also miss seeing her in ethnic wear. Oh, not that we are complaining too much; have you guys seen how rad she looks in whatever she wears in the US? All those bright and colourful ensembles that never fail to impress? But that is the thing: while all those dresses, co-ord sets, coats, suits make a statement with their stand-out-of-the-crowd appeal, when it comes to Indian wear, Priyanka somehow doesn’t make the same statement. We are talking about the actress wearing greyish white Tarun Tahiliani saree at Nita and Mukesh Ambani’s Mumbai home last evening. She was attending what was apparently their son Akash and Shloka Mehta’s mehendi ceremony. 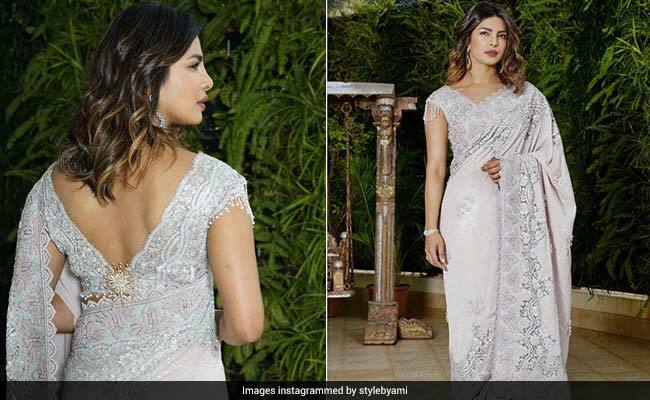 Now while the saree is beautiful, and no doubt that Priyanka looks pretty, we can’t help but wonder that maybe a brighter colour would have looked more glamorous. It is not like simplistic colours have not worked for her in the past. Look at this picture from when she went to meet PM Narendra Modi in a Rohit Bal saree. Or the time she wore a white Manish Malhotra saree for a book launch. And her sarees have also been quite rad in the past. For UNICEF’s fundraising gala dinner last year, she wore this Sabyasachi saree. Oh, and Ganesh Chaturthi last year saw Priyanka in this royal blue AM:PM suit. See what we mean about bright colours? It is an instant way to add so much drama to her ensemble. Here’s hoping stylist Ami Patel keeps our two pence in mind for Priyanka’s ethnic attire the next time. Just saying.